Then they discovered that Rowan has a profound affinity for animals, particularly horses. When Rupert began to ride with Rowan every day, Rowan began to talk again and engage with the outside world. Was there a place on the planet that combined horses and healing? There was Mongolia, the country where the horse was first domesticated, and where shamanism is the state religion. What if we were to take Rowan there, thought Rupert, and ride on horseback from shaman to shaman? What would happen? THE HORSE BOY is a magical expedition from the wild open steppe to the sacred Lake Sharga. As the family sets off on a quest for a possible cure, Rupert and Kristin find their son is accepted even treasured for his differences. By telling one family’s extraordinary story, the film gives a voice to the thousands of families who are living with autism every day. As Rupert and Kristin struggle to make sense of their child’s autism, and find healing for him and themselves in this unlikeliest of places, Rowan makes dramatic leaps forward, astonishing both his parents and himself. This movie was profound. I am really interested in autism – there are so many theories about what causes autism as well as how it is best treated. 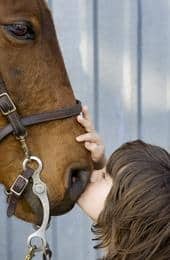 I was fascinated at how well Rowan (who was diagnosed with autism at the age of 2 1/2 and for whom conventional therapies had not worked) reacted to interacting with the horses. I also found myself drawn to Rowan’s parents and how dedicated they are to their son and the lengths to which they are willing to go to help him! There were times when this film made me smile and other times when it brought me to tears. 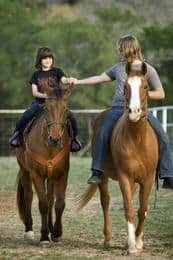 It is a truly complex film that I plan to share with a number of friends, including one who has horses and another who is the parent of a child with autism. I believe that this film will appeal to them both for completely different reasons. The Horse Boy will be airing this Tuesday (May 11th) on the series Independent Lens at 10 PM EST on PBS. For more information about The Horse Boy, please visit: http://www.pbs.org/independentlens/horse-boy/.